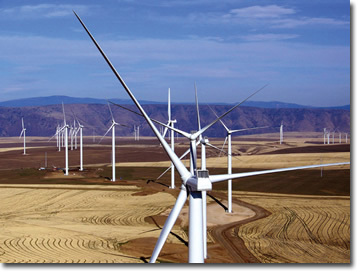 Portland General Electric is getting into wind power in a big way, with the 450MW Biglow Canyon wind farm in Oregon, one of the largest wind power facilities in the Pacific Northwest. The Biglow Canyon wind farm in Oregon is Portland General Electric's (PGE) first fully owned wind power facility, and the utility is going big with this project. When it's completed in the fall of 2010, the multi-phase project will deliver 450 MW of power, making it one of the largest wind power facilities in the Pacific Northwest. Projects such as Biglow Canyon deliver a lot of power, but they are also capital intensive, notes Gary Hackett, plant manager of the Biglow facility. "It represents a significant investment by PGE," he says. But the company is on a solid financial footing, he added. "We're a strong company and not having any problems getting the financing we need. It helps that Biglow Canyon is a premium site-there are good wind resources here in northern Oregon." The Biglow project represents the Oregon-based utility's largest ever single power plant investment, with an estimated price tag of $1.2 billion. As in the heyday of oil, when hundreds of derricks were tightly clustered in areas of Texas, today there are hundreds of wind turbines, delivering renewable energy along this stretch of north-central Oregon and southern Washington. "It's right in the center of prime wind country," says Hackett. "We can stand at a high point on Biglow and see upwards of eight wind power projects, either completed or going up around us." Biglow was originally developed by Orion Energy LLC. Before acquiring the project, the PGE team worked with the Orion team for over two years on all aspects of the project, from land rights to obtaining the site certificate and transmission rights. By the time PGE purchased the project, it was-as the term goes-pretty close to being shovel ready. "When we purchased the development rights from Orion, pretty much everything was in place except for the turbine procurement and a balance of plant construction contract," explains Hackett. PGE talked with a number of turbine suppliers. Due to an order cancellation, an opportunity opened with turbine manufacturer Vestas. PGE quickly struck a deal to purchase 76 Vestas 1.65 MW turbines-for a total of 124.5 MW-for phase one of Biglow Canyon. Along with the wind resource itself, one of the most attractive features of Biglow was that PGE could get a quick start on it. All the major permits had been obtained, and Orion had worked with the landowners, getting contracts and agreements in place. PGE wanted to move ahead with a major wind project, "and Biglow was ready to go," explained Hackett. From the beginning, Biglow was planned as a three-phase construction project. Phase one was completed in 2007, phase two will be completed this fall, and the third phase is scheduled to be delivering power in September 2010, from this largely agricultural area. While the land in this area can become a bit rocky as it drops off to the Columbia and John Day rivers, it is generally rolling land used for dryland farming. There is about 60 feet of soft, rock-free soil before you hit bedrock. Phase one of Biglow was completed in 2007, phase two will be completed this fall, and the third phase is scheduled to be delivering power in September 2010. D. H. Blattner is the general contractor for all three phases. "It's not perfectly flat, like a wind project site in the Midwest or Texas," says Hackett. "The rolling hills tend to define where we can build our turbines. As a result, it's not laid out perfectly uniform-the turbines are spaced out mostly on the ridges and high points." The geography of the region does vary a bit. Hackett notes that across the Columbia River, which divides Oregon and Washington, there is a high ridgeline that runs along the river, then drops steeply into the river valley. "It's quite different from what we have to deal with." But the area as a whole is still very open, with good wind resources, and it is lightly populated. 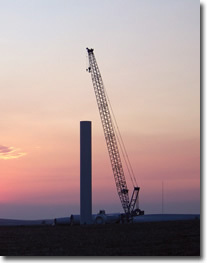 The Biglow wind project is in Sherman County, which has about 1800 residents, most of whom welcomed the wind farm and its benefits to the local economy, including local jobs. Local landowners even formed their own group to facilitate the wind farm development and management process (see sidebar story). Like other major rural areas, the county has its share of young people not interested in farming, who were relocating to find work. But they now have new job opportunities working in construction and, longer term, in operations and maintenance, with Biglow and the other wind farms. And Biglow has added significantly to the tax base. In terms of siting the turbines, PGE was granted corridors from the Energy Facility Siting Council (EFSC) as part of the permitting process and, for the most part, was able to locate turbines on the originally planned sites. "In the early days of development, we worked with Orion to optimize and microsite turbine locations," said Hackett. "During the construction phase, we made minor moves here and there to accommodate construction requirements or landowners, where they wanted to have a road over here, rather than over there, because it made it easier to farm, while still doing what we needed to do. "I'd say we have excellent working relationships with all of our landowners and the farmers we work with. In general, wind is not a negative four letter word in this county and with the landowners that we work with," he added. While PGE opted for Vestas turbines for phase one, the overall scope of the project dictated a change in suppliers for phases two and three of the Biglow project. Hackett. "We had to look at bigger turbine units, and we were able to work out an agreement with Siemens." For phases two and three, PGE will be installing 141 Siemens 2.3 MW units. At the time, Biglow represented one of the largest single turbine sales Siemens had ever made in North America. Dealing with multiple landowners can be a bit of a production for wind farm developers and owners. at the kitchen tables of farmers and other landowners, explaining the details of a project and dealing with individual landowners on an ongoing basis. It was quite a bit different with the Biglow wind project. Early in the project development process, a local wheat farmer, John DeMoss, and several others formed a local landowners' group, called Praise the Wind Inc. In total, Praise the Wind Inc. represented about two dozen landowners in negotiations with the developer of Biglow, Orion Energy, and subsequently, the owner of Biglow, Portland General Electric. Having one central group has made it much easier for the landowners and for PGE, reports project manager Gary Hackett. "We disseminate our payments to the landowners through Praise the Wind. It makes it much easier-we deal with Praise the Wind, rather than the individual landowners and other landowners, such as corporations and trusts." Sadly, Praise the Wind founder John DeMoss passed away last year. "John's legacy lives on, though," said Hackett. A memorial is being planned for DeMoss as part of the public tour of the Biglow wind farm. On the actual construction side, high winds-not surprisingly- have been the single biggest challenge in erecting those turbines, says Hackett. "We had a bit of rain and mud, but wind was the biggest challenge. 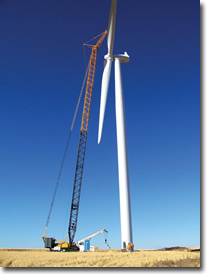 We had over 30 wind day delays during the construction of phase one alone." They broke ground and started building roads for phase one in April 2007. Their targeted completion date was December 31, to capture tax benefits. "We were actually able to commission our last unit of phase one on December 21, in spite of wind, snow, and cold weather. So we met our deadline and came in under budget." This included building the substation and an operations and maintenance facility. The Bonneville Power Administration operates the electricity transmission system in the region, and they built a 230KV transmission line during the same time window, to take power to their John Day substation. The line serves the Biglow project and the nearby Klondike wind project of Iberdrola Renewables (formerly PPM Energy). The two companies co-funded the line. The primary contractor for the underground transmission system installed at Biglow-between towers and the substation-was Rosendin Electric, a subcontractor to D. H. Blattner. This being farm country, there was a county road network, some paved/some gravel, for PGE and D. H. Blattner to work with. Each of the three phases is expected to require an additional 20 miles of road. Hackett praised the work of D. H. Blattner, the general contractor for all three phases. "At one point, they were completing two turbine foundations a day. With phase two, the roads, foundations, and collection systems were completed before the first turbines even arrived on site." Keeping a three-phase, 450 MW project on track requires a lot of work on everyone's part, from PGE to D. H. Blattner to all the subcontractors involved. To keep it all moving forward, there are daily construction meetings, weekly summary meetings, and monthly management meetings to coordinate all the different moving construction parts. Hackett noted there was a tremendous amount of work on the turbine parts side alone. "Each turbine involved about ten trucks delivering parts from the Port of Vancouver, Washington. So we had over 700 truckloads of equipment for phase one, and we'll have considerably more for phases two and three because they are bigger turbine units." This involved a huge amount of truck traffic moving along the Columbia River Gorge transportation corridor. "You could not drive down towards Portland and not pass six or eight trucks of turbine equipment headed up to the Biglow site." Hackett said there are a number of reasons why PGE opted for a multi-phase, not the least of which was the sheer size of the project. Other reasons included available construction windows and the ability to spread out the financing requirements for such a huge project. Along with the wind resource itself, one of the most attractive features of Biglow was that PGE could get a quick start on building the project when it was acquired from Orion Energy LLC. All the major permits had been obtained, and landowner agreements were in place. He noted there was a flow of work between the phases. "We moved the construction window for phase two so we could start it right after phase one, so we worked through last winter. We had a lot of cold and snow and freezing weather, which kind of slowed things down. But the crews stayed mobilized and on site, and kept working." They are taking similar steps with phase three. "We've done the same thing and have worked out an arrangement where crews are continuing road construction and foundations right on through. We're well ahead of the curve." The only snag, and what might be a caution for other wind farm builders, says Hackett, is that they ran into problems with some communications cable. The cable, which was laid on phase one, was supposed to be rodent-resistant. That said, there was a pocket gopher in the area that just loved to eat cable-and attacked it in a number of areas. They re-laid the cable, this time in a heavy conduit. Hackett described the cable problem as more of a nuisance, than a problem. But it drives home the point that you can't have too much knowledge about your work area. "Be aware of your surrounding area and the critters that live there so you don't get surprised," he advised. Hackett described these particular critters as "gophers on steroids." From dealing with local animals to working in demanding weather, it will all be helpful for PGE as it moves forward with other wind and renewable energy projects. About four percent of PGE's power currently comes from renewables, and that is expected to increase to 10 percent by 2011. PGE fully expects to reach Oregon's Renewable Portfolio Standards goal of 15 percent of power from renewables by 2015, and 25 percent from renewables by 2025.